From general dermatology concerns to the most advanced skin treatments and procedures, all of your family's skin care needs can be addressed at this dermatologist in Covington office. Your skin is a vital part of you and your overall health. It works hard to protect you, and it deserves quality care. Many people visit Soine Dermatology & Aesthetics for skin cancer screenings, troublesome dry skin and even excessive sweating. With the help of the professionals at this dermatologist in Covington LA practice, you can truly be comfortable in your own skin. Skin disorders are a common concern plaguing people of all ages. Some of these cause embarrassment, physical discomfort, and cause health concerns. Many effective treatments are available for common skin disorders including skin cancer treatments. With state-of-the-art technology and compassion for patients and their families, Dr. Soine has the right treatment for you. Soine Dermatology & Aesthetics offers a full menu of cosmetic dermatology treatments. Unlike plastic surgery, these procedures are minimally invasive and require little or no down time. Examples include injectables and fillers, wrinkle treatments, skin tightening procedures, and more. Each state-of-the-art treatment has undergone significant scientific research to ensure safety and FDA approval. If you have unwanted hair, crow's feet or age spots, or ever suffer from excessive sweating, a laser skin treatment may be the ideal choice. Dr. Soine and his staff use the latest innovations to treat common skin care concerns. Precise, controlled applications of laser technology can be used to correct a multitude of issues. There's no end to the beneficial effects that can be achieved with laser skin treatment. miraDry is the only non-invasive, FDA-cleared treatment to eliminate sweat and odor glands in the armpit area. Ultherapy uses ultrasound technology to stimulate collagen growth beneath the surface of your skin which smoothes and tightens. KYBELLA is the first and only non-surgical treatment approved by the FDA to improve the appearance of a double chin. "Dr. Soine and his staff are AMAZING! They are always so friendly and go out of their way to give you the best experience you can have for any aesthetic or dermatology procedure. Dr. Soine is truly the best and I will never go to anyone else!" "I had an appointment today for my first-time visit....I was so impressed by the friendliness of the staff and by the doctor himself! He took time to talk with me and made me feel comfortable by answering all my questions in an easy-to-understand manner. I was in and out in no time and wouldn't hesitate to recommend Dr. Soine and his staff to anyone!" "I've been a nurse for over ten years and have met a lot of doctors and hands down this is one of the best doctors I have ever met. He has an awesome beside manner and made my daughter feel at ease, his office staff is excellent also. Very professional and friendly!" "Took my 16-year-old for the first time! We both loved it. Communicated with my daughter on her level and spoke directly to her! Even had late enough appt so I did not have to take her out of school! Love, love, love!" "So knowledgeable and attentive to details. Warm, personable and engaging - both doctor and staff. You really get superior care." 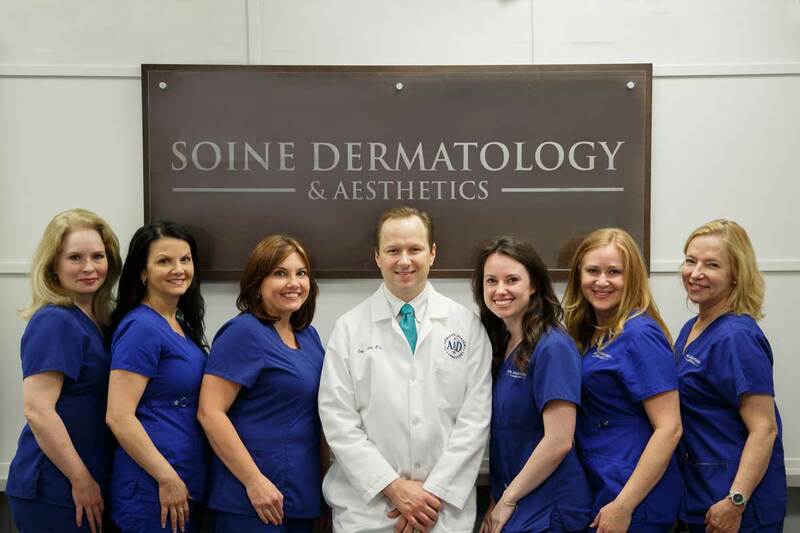 Dr. Soine and his dedicated staff are devoted to providing excellent care and is considered the best dermatologist in Covington LA by his loyal patients. See for yourself why Dr. Soine and his team operate one of the most highly respected dermatology practices in Covington and the surrounding areas.